The oldest and most inscrutable empire on the Discworld is in turmoil, brought about by the revolutionary treatise What I did on My Holidays. Workers are uniting, with nothing to lose but their water buffaloes. Warlords are struggling for power. War (and Clancy) are spreading throughout the ancient cities. ..and a very special butterfly. 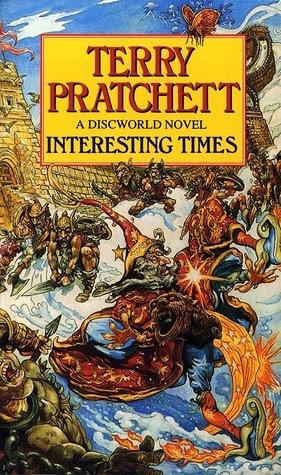 Thoughts: With the recent passing of Terry Pratchett, it was impossible for me to not read one of his books. I really like this cartoon a Pratchett fan drew so thought a book that featured the luggage was particularly fitting. Once again, Pratchett did not disappoint. A scheming warlord who wants to be Emperor, a band of ageing barbarians, Rincewind the wizard, the luggage and even a brief appearance by death towards the end. What more could you want from a Discworld novel? As always if you want to look beyond the bare basics of the novel, there is a lot of commentary about society and the silly way cultures have done and continue to do things simply because that's the way it's always to be done. Or you can just take it as a rolicking good read and find yourself sniggering at the funny bits on public transport!